Playing hits all the way from the jiving sounds of the 50s all the way to modern classics and chart smashers, Outside In are one of Lincolnshire's most talked about function bands. With over 13 years live experience as a group playing across the UK to all size crowds they always leave the audience clambering for more. 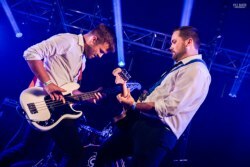 With their unique blend of wide musical repertoire, commanding stage presence and lively fun atmosphere Outside In are definitely one of the UK's must book bands! Whether its a Wedding, Birthday, Party or even just the local pub, Outside In put on a show rivalled by no other and will always have the audience screaming for more.